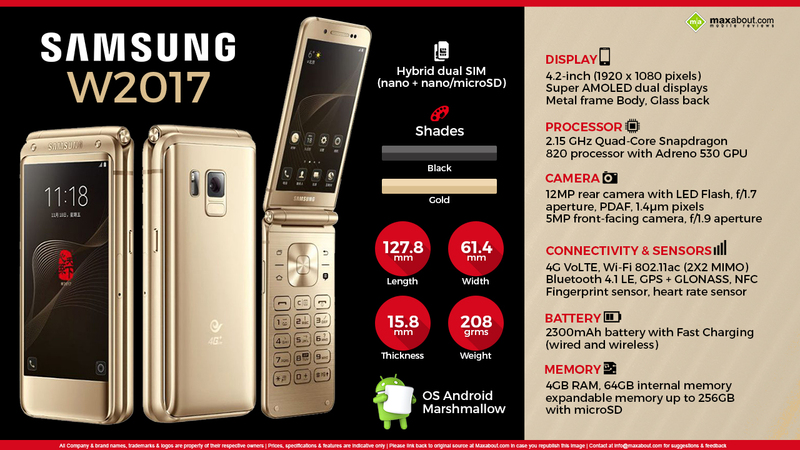 Samsung W2017, the premium flip phone from the company was announced recently at an event in China. It is a worthy successor to the last year's W2016 and carries mind blowing components in its body. The first visible thing is its flip design and dual 4.2 inch, full HD and Super AMOLED displays. The outer screen can be used without flipping the phone while the inner screen is said to have control through the keyboard. The current shade options include Black and Gold only. The phone runs on 2.15 GHz, Quad Core Snapdragon 820 processor, coupled to 4 GB of RAM and 64 GB of internal storage. It even gets 256 GB of expandable storage option through MicroSD card. It uses a 5 MP front camera while the rear unit is a 12 MP camera with LED flash. W2017 uses 2300 mAh battery with fast charging option while other important features include heart rate sensor and fingerprint sensor. It is quiet thick and heavy, measuring 15.8 mm and 208 grams respectively. There is no word regarding the price and availability in India.